Definition: Measles (also called rubeola or morbilli) is a childhood infection caused by a virus. Once quite common, measles can now almost always be prevented with a vaccine. It was once one of the most common childhood infections in North America. Measles is a very contagious disease that can spread through contact with infected mucus and saliva. An infected person can release the infection into the air when they cough or sneeze. Symptoms usually develop 10–12 days after exposure to an infected person and last 7–10 days. Initial symptoms typically include fever, often greater than 40 °C (104.0 °F), cough, runny nose, and inflamed eyes. Small white spots known as Koplik’s spots may form inside the mouth two or three days after the start of symptoms. However, if measles enters an area where the people have never been exposed, the result can be devastating. 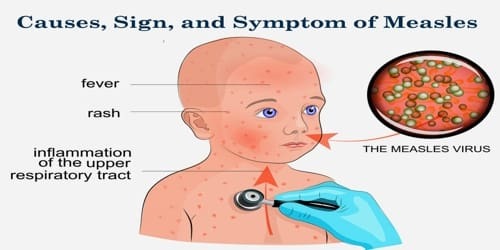 Measles: This is the standard form caused by the rubeola virus. Rubella, or German measles: This is caused by the rubella virus. Vaccination prevents many cases of measles around the world. The World Health Organization (WHO) estimate that 2.6 million people who have not had the vaccine die of measles every year. Here are some key points about measles. More detail is in the main article. Measles is one of the most contagious vaccine-preventable infections in humans. The one antigenic type of the measles virus is only found in humans. This means that if high immunization rates are maintained, it may be possible to eradicate this virus, just like smallpox and polio. 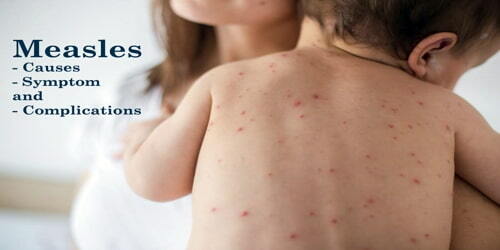 Causes, Sign, and Symptom of Measles: Measles is a leading cause of death in children. Of the 114,900 global deaths related to measles in 2014, the World Health Organization (WHO) reported that most of the victims were under the age of 5. Measles is caused by a type of virus called a paramyxovirus. It’s transmitted in tiny droplets when an infected person coughs, breathes, or sneezes. It is an airborne virus, which means it is highly contagious. Research shows that only 10% of unvaccinated people who share a house with a measles patient escape infection. Risk factors for measles virus infection include immunodeficiency caused by HIV or AIDS, immunosuppression following receipt of an organ or a stem cell transplant, alkylating agents, or corticosteroid therapy, regardless of immunization status; travel to areas where measles is commonly occurs or contact with travelers from such an area; and the loss of passive, inherited antibodies before the age of routine immunization. Complications of Measles: Complications from measles are fairly common. Some can be serious. It is important to receive a measles vaccine because measles can lead to life-threatening complications, such as pneumonia and inflammation of the brain (encephalitis). Brain inflammation from measles has a mortality rate of 15%. While there is no specific treatment for brain inflammation from measles, antibiotics are required for bacterial pneumonia, sinusitis, and bronchitis that can follow measles.